As marital compromises go, Castle Ward could be one of the most public and striking of all time. 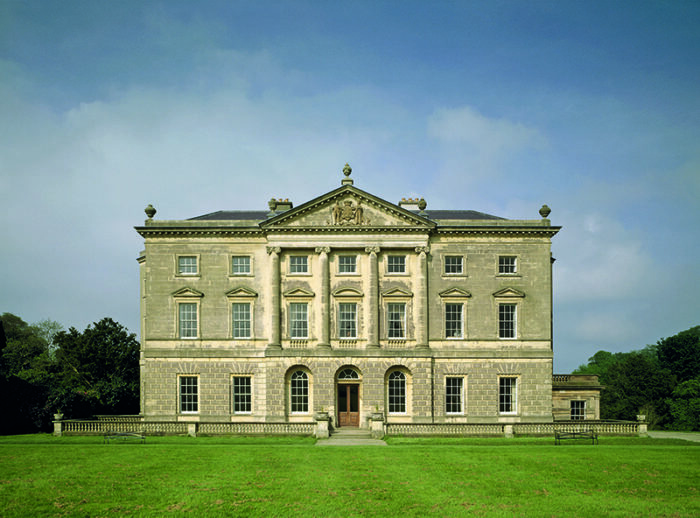 On approach, you’ll see the house’s entrance and front façade, and be sure you’re visiting a property in the Palladian style: it’s plain, politely in proportion and with symmetrical columns and a simple pediment crowning the roof. Take a stroll around to the back of the building, however, and the house becomes a homage to Gothic architecture with pointed doors, rooftop spires and ogival windows. The unknown architect certainly did a fine job of marrying these two very different styles on behalf of the aristocratic couple Bernard and Anne Ward. Theirs was a powerful union: she the daughter of the 1st Earl of Darnley, he an Irish politician who would later become 1st Viscount Bangor with Castle Ward as his seat. The insistence of each on having their own way extended to the interior design: indoors the compromise is equally dramatic with east facing rooms in the Classical style, while rooms to the west are defiantly Gothic. 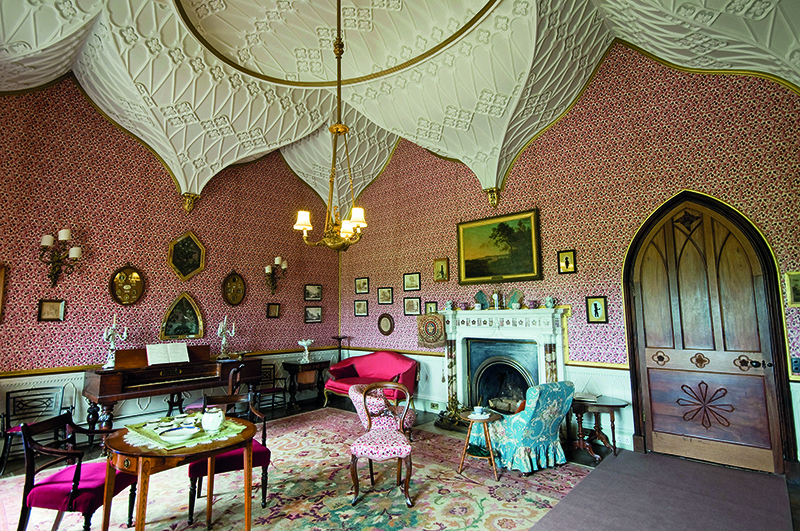 Visit the National Trust-run property today and the guided tour will take you through Lady Anne’s bold boudoir, dominated by a plaster recreation of the fan-vaulted ceiling of Henry VII’s Chapel at Westminster, as well as a neoclassical hall with decorated walls, colonnades and a simple Georgian ceiling. It’s a matter of opinion, of course, but they certainly don’t appear to have ‘spoiled’ the landscape. Perched near the mouth of the Strangford Lough, flanked by lawns and gardens, Castle Ward occupies a prime position in the County Down countryside. 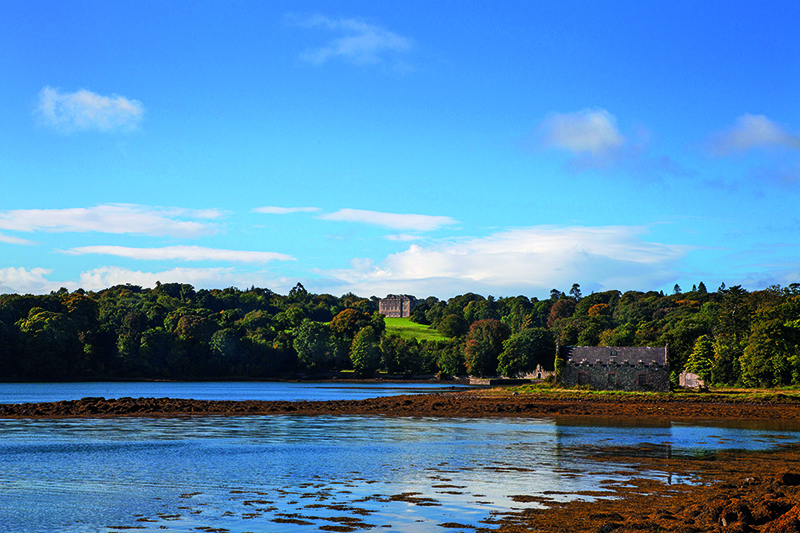 Distant 18th Century Castleward on the banks of Strangford Lough. In many respects, the 850-acre grounds of Castle Ward appears untouched for centuries – look out for paintings by Irish landscape artists Ashford and Fisher amid the mismatched interior design, and compare the current views of the house and its surroundings with their 18th-century take on the same setting. There is the wonderful Forest Park, gorgeous green spaces, water features, and some later-installed Victorian features in the shape of a sunken garden and a heather-laden rockery. You can explore all this formal planting and exceptional wild countryside on one of the many crisscrossing trails, one of the simplest being from the house to the lapping shores of Strangford Lough – the largest inlet in the British Isles, and home to abundant and varied wildlife. It’s a tranquil and charming spot, complemented by the rather more formal Temple Water, just a brief walk away. This man-made landscape features a lake presided over by an imposing temple. Access is currently limited as the National Trust is restoring the area – there are plans to reinstate original paths and level the walled garden. In the meantime, you can explore the nearby and incredible three-storey tower, Old Castle Ward. Built in the late 16th-century by Nicholas Ward, it sits in stark contrast to the main Georgian estate, with its thick, stone rubble walls, tiny windows and intriguing booby traps (designed to fend off unwanted visitors). The tower is part of a quaint farmyard that offers families the chance to get close to some friendly goats, pigs and hens, and look around the working corn mill and artist’s studio. Old Castle Ward showing the clock tower in the centre and the corn mill on the right. On a quiet day, you may not twig that it is that unassuming 19th-century farmyard that draws in coach-loads of visitors, and has arguably become a more famous attraction than the main house. On a busy day, the men in cloaks and women wielding swords point to the farmyard’s use as a location for the popular HBO series Game of Thrones. 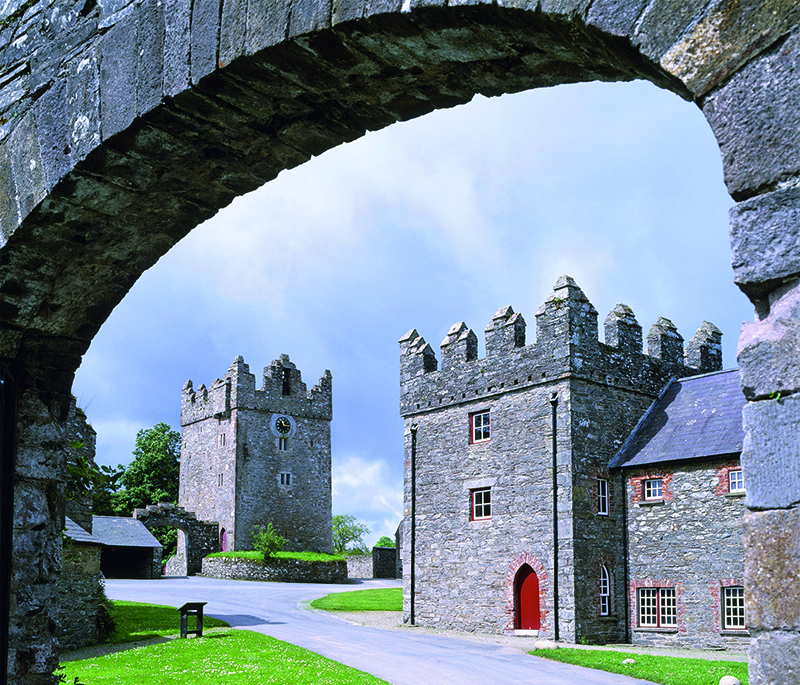 Fans will immediately recognise that the historic buildings and courtyard are actually Winterfell, seat of the Stark dynasty. And they may also spy the Whispering Wood, Robb Stark’s Camp and the site of the Baelor battle, which were all also filmed at Castle Ward and the nearby Audley’s Field, a lough-side green space with a small castle thought to date back to the late 1400s. Northern Ireland is a pilgrimage site for Game of Thrones aficionados, with dozens of filming locations across the country and tours that ferry viewers between them. Castle Ward is rightly one of the jewels in any tour’s crown, and one of the highlights is the opportunity to enjoy a bit of dressing up (costumes are provided) and have a go in the Winterfell Archery Range, which has been constructed in the same spot that the original filming took place (book in advance with Clearsky Adventure). It’s all discreetly done in an enclosed courtyard, so if you have no interest in this mini Westeros world, it need have little or no impact on a visit to Castle Ward, which has plenty of other diversions.